Our research suggests that the exploration of 3D virtual environments that are found within modern day video games, may provide our brain with meaningful stimulation and improve memory. In animal studies, it is well understood that simply exposing animals to a larger and more stimulating environment, known as environmental enrichment, can improve memory and induce neuroplasticity within the brain. This powerful yet simple manipulation is even able to ameliorate cognitive deficits associated with healthy aging and other neurodegenerative disorders. In addition to the complexity and richness that the enriched environments provide, the exploration that occurs when presented with a novel environment is key to this manipulation. In both animals and humans alike, the hippocampus of the brain plays a pivotal role in spatial navigation. In fact, underlying neural networks within the hippocampus are directly related to the navigation and exploration of novel environments. There is even evidence in humans demonstrating structural changes in the hippocampus with large amounts of spatial training and expertise. As scientists, we are ultimately interested in whether these manipulations that have proven so successful in animals, translates to humans. Video games are part of a multi-billion dollar industry. The combination of high-resolution graphics, faster computer processors, captivating adventures and online communities have led to video games that are more engaging and immersive than ever before. Adding to the excitement are the vast and complex 3D virtual environments in which these video games take place. Often, success in video games requires a keen map knowledge and spatial awareness to navigate these virtual environments and complete missions and objectives. 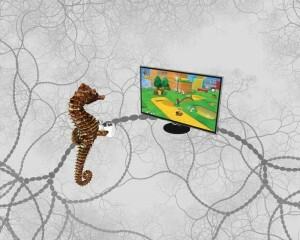 While human studies have used virtual environments to demonstrate an active role of the hippocampus in navigation and spatial memory, the environments found in modern video games are far richer and more engaging that those used in typical laboratory tests, giving greater opportunity for the games to stimulate the hippocampus. In this study, we show that young video gamers that focus on 3D video games perform better in hippocampus dependent tasks when compared to 2D video gamers. In addition, while attending a video game tournament, competitive 3D video gamers performed better than competitive 2D video gamers in the same hippocampus dependent tasks, suggesting that this difference persists despite individual experience or video game training. Finally, we designed an intervention study where we trained naïve video gamers in a 3D video game (Super Mario 3D World), a 2D video game (Angry Birds) or a no-game control. We found that participants who trained on the 3D video game showed improvements in hippocampus dependent memory tasks. Performance in the behavioral tasks positively correlated with performance on the 3D video game but not the 2D video game. These results support the idea that the exploration of 3D virtual environments found within modern day video games can meaningfully stimulate the hippocampus. In contrast to “brain training” games, commercial video games are not created with specific cognitive processes in mind, but rather designed to captivate and immerse the user into characters and adventure. Rather than isolate single brain processes, video games can naturally draw on or require many cognitive processes. It is quite possible that by explicitly avoiding a narrow focus on a single or small set of cognitive domains and by more closely paralleling natural experience, immersive video games may be better suited to provide enriching experiences that translate into functional gains.